41 Mahatma Gandhi Inspirational Quotes About Life - Motivate Amaze Be GREAT: The Motivation and Inspiration for Self-Improvement you need! A symbol for freedom and non-violence, Mahatma Gandhi's legacy is still to this day an influence to anyone who wants to build a better world. It all starts with you and your actions, no greater truth than this one to describe what Mahatma Gandhi's life was all about. 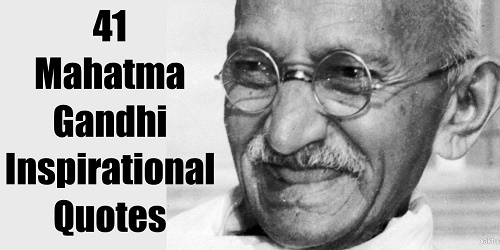 We've selected the best Mahatma Gandhi inspirational quotes for you to grasp this man thoughts and philosophy about life. Besides that, we've analyzed each quote and it's meaning with a brief explanation, for you to get inspired and use this quotes with the power you have to make a change in your life, and therefore, in this world. Quote explained: Seize the moment, live without regrets, do what you have to do. Don’t postpone things for tomorrow, because tomorrow might not come. Be a lifelong learner, it’s never too late to learn something, there is always something new that can change your perspective on things, keep an open mind. Quote explained: Be humble because life is about ups and downs, one day you’re up next day you could be down, who knows? Wisdom is good, but don’t be overconfident about it, you might be on the negative end one day, keep learning keep getting sharp, don’t stop. Quote explained: Your true value goes beyond you, you can only find it when you are serving others for the greater good, not for selfish reasons. Quote explained: It takes courage to love, to show love, and to follow what you love, despite what others think about it. Running away from love it’s not noble, it’s easy and requires no brave act or effort. Quote explained: Anyone has the ability to do something amazing in their life, but it requires spirituality to come into play. We have to allow it and be worth it of it, you have to plant the seed and believe amazing things can happen. Quote explained: The mind is the most powerful tool one can have, no one can take your freedom of thought. Persistence and resilience can take you to places you never thought of. Quote explained: To keep resentment is something weak because it can trap you and freeze you from taking action. Let go and forgive, turn the page, carry on to the next chapter don’t hang on resentment or your live won’t advance. Quote explained: Love can override anything, while the obsession with power can destroy anything. Quote explained: If you ask most people if they are giving their all, most will answer no. That’s the problem but also the solution, image if most people give all their effort and dedication, instead of doing pointless things that don’t solve anything? That’s the point! Quote explained: Our thought become words, words become actions, and actions make you or break you. So think the right thoughts and become the think you want, it’s that simple. Quote explained: Put your heart in anything you do, because when love is involved nothing can’t stop, you go that extra step, the necessary extra step to make it. While, on the other hand, when love is not involved it’s easy to give up and don’t achieve anything. Quote explained: That’s as sure thing, if do nothing you get nothing. If you do something, whatever it is, you get a result. So, you have to take action, it’s an indispensable step if you want to produce a result. Quote explained: Fear requires nothing. It takes courage to have faith and believe what it’s not visible at first sight. Quote explained: Yes, to achieve great things small actions are required. Those small actions you think are easy and you can postpone for tomorrow (insignificant), are the most important things you can, because if done with consistency, they can change everything. Quote explained: It’s not the destination, it’s the journey that is worth it. It’s the journey that takes you from nothing to something, that is irreplaceable, that makes you grow and become something different. Quote explained: Doing things faster with more intensity it’s good. But it’s not the quantity of action that makes the difference, but rather the quality of your actions. Content is king. Quote explained: You have a unique vision and perspective on things. Your thoughts and opinions really matter, not letting the world know about it it’s a coward act, because you’re neglecting the power you have and the world needs to make a change. Quote explained: Actions speak louder than words, when you take action you can change things. A prayer by itself, will not change anything, unless it makes you act. Random acts of kindness are possible to any of us, make use of this power and help people in need. Quote explained: School curriculums won’t teach you everything you need to know about life, but a strong home education can do that. Schools has its place, but parents are the number one responsible force to raise a child. Quote explained: You cannot hold faith, it’s not something you hold and expect to gain something from. You have to practice it and practice, you have to believe time in and time out, so eventually you get the necessary strength to transform yourself and grow into something better. Quote explained: You are in control, don’t get it twisted. Circumstances happen to us all, but it’s not the outside that is responsible for our feelings, it’s the inside. You can only get hurt if you let it. Quote explained: Love is the strongest force one can have. The non-violence Gandhi philosophy at his best, compassion and love for mankind can make you unstoppable. Quote explained: When everyone agrees on a matter stay alert it could represent no growth, because people can agree just to stay in their comfort zone and don’t have to make any change. But, no change no progress. It’s when people are honest and speak their mind that improvement can be reached. Adjustments have to be made time to time, let your voice be heard and take the time to hear others. Quote explained: If you can control something in your life it’s from your inside, that’s what you should focus on. Outside circumstances happen to us all, it’s the way we deal with them, the way we think and react to them that dictates your outcome. You can only do that from within. Quote explained: Past experiences can bring you down, to focus on them prevents people from acting in the present moment. But whatever you’ve gone by, you can only make a change if you concentrate on today, that’s how you can make a different future. Seize the opportunity every today brings. Quote explained: Love is the fuel of life. It makes us achieve impossible things, it makes us keep on going when logic tells you to quit. Quote explained: Live fully die empty, that’s the philosophy underneath. There is always a new opportunity each day, make the best of it, and move on to the next day. Quote explained: It doesn’t matter what other people think, as long as you are certain of what you’re doing. Build yourself up inside, with strong values and beliefs. Quote explained: Most people who succeed in life were considered insane somewhere in time. As long as killing your own kind isn’t your mojo, you’re good, let them call you insane and make fun of you. You know what you’re doing and don’t have time to care about what others think. Quote explained: Gandhi’s life story is full of struggles and setbacks. Despite this, is way of dealing with circumstances is to have a sense of humor, something to laugh about. No matter how bad situations turn out for you, a great sense of humor can help you solve your problems. Quote explained: What makes a bodybuilder lift a weight no one else can, it’s not his physical attributes but the will to be the best he can possible be. He’s driven and committed to his goals. Define your goals and develop the desire to achieve them that’s what strength is all about. Quote explained: You don’t need much to have a great life. Happiness it’s not on things, it’s on doing and achieving. Materialism will give you just momentary satisfaction. Quote explained: This one of the most known Gandhi quotes. People follow examples, not advices. That is the best way to influence someone to do something. Don’t tell them, show them! Congruency with your words and actions, that’s what you should chase. Quote explained: You can say what you want, you can wish it, but nothing will change unless you do something about it. That is to turn a thought into reality. Some people talk a good game, but do the exact opposite of what they say. They have their priorities mixed up. For instances, you say you want a degree but you stay partying and hanging out all night, your priority is to have fun when it should be to study. Quote explained: Once again love, and this time one of the great characteristics love has. Anyone can love, anyone can be loved. It requires no resources just you, your heart and your desires. Quote explained: You can’t control what other people do, but you can control who enters your mind or not. Take advantage of this ability anyone has, if they put their mind to it. Quote explained: What you believe you become, your thoughts turn into words, and words turn into actions. That is the process to succeed, if you neglect one of the stages you won’t achieve your outcome. If you believe really hard in something but don’t practice it, you’re not being congruent, you’re perpetrating the fraud. Quote explained: Don’t be so hard on you, that you don’t forgive yourself for your own mistakes. Inner freedom to take risks and to commit some errors is necessary to learn with life and eventually to improve. Quote explained: No one can bring you down, only if you give them permission to it. You can’t control what people say, but you can control how you react to it. Don’t get caught up with critics. Quote explained: For all that I am, not much I need to say. Actions speak louder than words. You don’t need to say much, if you’re diligent and deliver. Your legacy it’s not what you say but it’s actually what you do. Do you have any favorite Gandhi Inspirational Quote? Are we missing some? Let us know in the comment section bellow.